I will be coming with my family in August to visit the area around Alice Springs, and we have allocated about 6 days for this area. We are thinking of renting a campervan, and I was wondering if we would need to specify a 4WD van to be able to drive on some of the dirt tracks in the area. Most campervans seem to be 2WD. If we could only get a 2WD campervan, would this greatly restrict where we could realistically visit in 6 days? Also, are there any problems camping out in that time of year? I guess it must get cold at night. If possible I would like to hire a van at Ayers Rock Airport and drop it off at Alice Springs airport. Would that be possible? Final question. Although I can find general itineraries and ideas for touring in the area, is there somewhere where I can find detailed itineraries which indicate a choice of "ideal" tours in the area, mentioning good places to camp, etc? Well, if you take a 2WD or a 4WD depends very much on what exactly you want to do. Any dirt roads require a 4WD. You are not allowed to take 2WD vehicles on unsealed roads. So if you plan to drive from Kings Canyon to the West MacDonnell Ranges on the Mereenie Loop Road, you'd need a 4WD. In a 2WD you'd have to make a big detour. You would also need a 4WD for places like Palm Valley, Chambers Pillar, and some places in the East MacDonnell Ranges. But 6 days is not a lot of time, and there are many places in the Alice Springs area that you can access with a 2WD. Even with only a 2WD you could certainly do a lot in those 6 days. The only draw back would be the big detour to get from Uluru/Kings Canyon to the West MacDonnells. Here is a map of the area that shows where everything is, which roads are sealed and which aren't. For itineraries you could do a web search for Alice Springs tours or Ayers Rock tours, and see what the tour operators are doing. That usually gives a good idea of what's possible and makes sense to fit into one day. The NT Tourism bureau also has some suggestions on their site, here. You'd have to first decide if you go by 2WD or 4WD, and what places you'd like to see, before anyone can tell you much about an itinerary. Have a read through the information that's available here for the attractions in Alice Springs. If you stick to your plan of arriving at Ayers Rock and leaving from Alice Springs, you would spend a night or two at Ayers Rock, one at Kings Canyon, then one or two somewhere in the West MacDonnells. Then you could go for a dash into the East Macs or you take it easy and see more of Alice Springs. You will need to talk to the individual hire companies to find out what they can do for a one way hire from Ayers Rock to Alice Springs. I'm also not sure you can get a camper at the airport. I would consider driving from Alice to Alice, but see what you can find. There are no problems with camping out at any time of the year, but you will need warm clothes and a good sleeping bag. It will get very cold. The lowest night temperatures will on average be around 5°C, but they can also drop below zero! 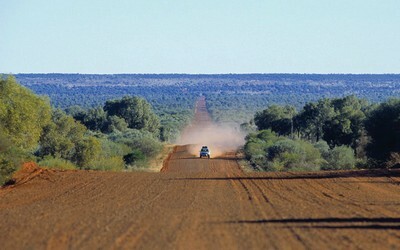 It is not correct that 2WD vehicles are not allowed on unsealed roads in the NT. Just as many 2WD vehicles as 4WD vehicles travel these roads every day. In any vehicle common sense is needed. My post was not a general statement, it was an answer to the original poster's question. See the original question. David is hiring a car. No hire company allows you to take 2WD vehicles on unsealed roads. I'm just interested in whether the Mereenie Loop is quite doable in a personally owned higher clearance 2wd, like a Ford Territory - or is a 4wd really required? Either because the road conditions demand it, or because 2wd is just prohibited. And while I'm asking - is 4wd actually required for the roads into places like Palm Valley or, again, is it really clearance that's needed? Thanks to whoever knows and can give an opinion. Mereenie Loop: check the road conditions at the time. It should be ok in a Territory, and if in good condition even negotiable in a 2WD. But don't count on it, always check current conditions. For Palm Valley you want a high clearance 4WD. The Alice Springs Desert Park, a multi-award winning park, is the first of its kind in the world and showcases the plants, animals and landscapes of Australia's deserts and their traditional use by Aboriginal people. But i liked the Reptile Center, as my kids were happy after holidaying here. This huge reptile display is paradise, featuring over 30 species and a chance to feed and get up close to many of them. As compared to the other developed cities of Australia, the Alice Springs is a town in itself. It takes a few days to see everything properly in Alice. Just done Ernest Giles Rd with Volvo 940, no problem, just drive within the capabilities of vehicle. Also continued on dirt from Uluru to Laverton same vehicle, again no problems, again drive according to road conditions. I carried extra spare tires plus fuel, plus sufficient water in case of breakdown. 4WD not needed but take care.